After over a month of fierce clashes in the last stronghold of Islamic State in Baghuz village, Syrian Democratic Forces (SDF) have announced “final defeat” of the terror group. SDF, a force comprised of Kurdish and Arab units that is considered the closest ally of the US in the fight against ISIS in Syria, managed to overcome ISIS defenses with the support of the US-led International Coalition. The clashes resulted in severe casualties on both sides, while hundreds of terrorists as well as their wives and children surrendered to SDF. The terrorists in SDF custody were presented a deal which involves fighting against the Syrian government forces in oil-rich desert area in eastern Syria, informed sources reported. US military offered the terrorists an opportunity to “redeploy” to Al Tanf area located on the Syria-Iraq border where US maintains a small contingent of forces, according to the sources. 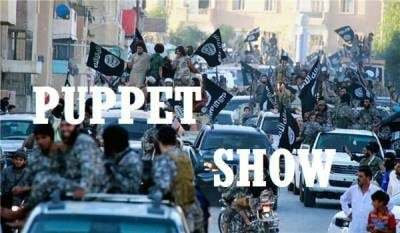 Holding the families of the captured ISIS members hostage, the US demanded that the terrorists launch an offensive against the Syrian army and establish control over Al Shaer, Al Maghara, Al Jazal and Tuwaynan oil fields. Another goal of the offensive is capturing Khunayfis phosphate mine and forcing the Syrian troops to abandon the checkpoints on the strategic Damascus – Deir Ezzor highway. First batches of ISIS terrorists have already arrived to Al Tanf and were positioned at the training camps in the area. They have already set up ambushes and executed surprise attacks against the Syrian troops, killing at least 20 soldiers during the past few days, sources added. The terrorists are benefiting from difficult terrain and establish hide-outs and weapon stashes in caves and wadis that are abound in this desert region. They also enjoy continuous support and reinforcement from Al Tanf. However, informed sources claimed that this clandestine operation is only a part of a bigger long-term plan of the US command to preserve American influence in this resource-rich area. According to the plan, after ISIS succeeds in capturing territory from the government forces, the SDF will intervene to “liberate” and seize control of the desert areas acting under the pretext of fighting terrorism. These claims are supported by the rumors that the SDF command rejected appeals to relieve the fighters of their duties hinting at a possibility of another “large-scale” operation in the near future. This scenario is painfully reminiscent of the path the Pentagon took in northern Syria, where SDF overcame ISIS after the terror group had captured the area from the government forces. Should this plan succeed, the US will get to keep its military presence in Al Tanf.